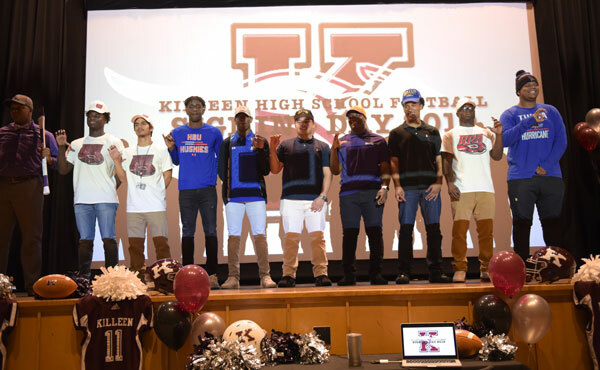 In signing ceremonies at all four Killeen ISD high schools Wednesday, 31 students are set to sign letters of intent to continue their education and athletics at a variety of colleges. It was National Signing Day across the country. At Shoemaker High School’s ceremony in the gym, Athletic Coordinator Toby Foreman challenged the large audience of students to consider that their nine peers signing worked hard throughout their schooling to reach the important day. “This is the most exciting day of the year for me,” the athletic coordinator said of the traditional signing day the first Wednesday of February. From earliest childhood through elementary and middle school and on to high school, the seniors, leaned on the wisdom and support of teachers, coaches, secretaries, aides and other school staff and especially on family members, he said. It’s not about winning championships, Foreman said, but about setting and meeting goals along the way. The signing students, all seated at a long table on the gym floor in front of a packed audience, played football for Shoemaker and most competed in multiple sports. One, Freddie Hicks, did practically everything, the head coach said. The all-everything Hicks chose to continue to play football even when he earned a drum major position with the band. He signed Wednesday to attend Prairie View A&M University, where he will play the band and study music. 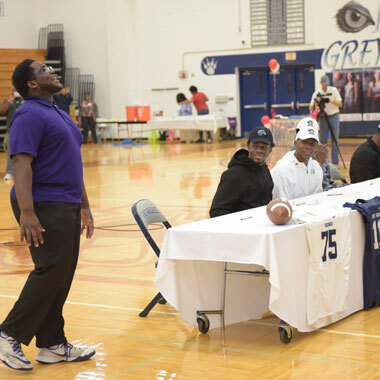 To end the formal part of the signing ceremony at Shoemaker, Hicks led the enthusiastic crowd in the school’s popular chant. At Killeen High School on the auditorium stage, Athletic Coordinator Neil Searcy praised a group of 10 students for representing the school and their families with character in class and in competition. Each student mounted the stage with family members and signed their letter as highlight video from Roos football games rolled on the screen. Position coaches described each student, noting their leadership qualities and dedication to academics. Finally, each student athlete took the microphone and gave thanks to family, coaches and educators and many praised God and individual friends, as well as the tight-knit group of senior football players. 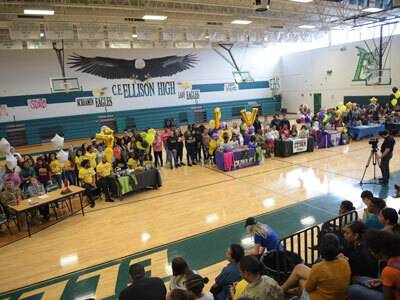 In the Ellison High School gym, Athletic Coordinator Todd Wright and Assistant Athletic Coordinator Sarah Stolley introduced eight students signing letters of intent. First, Ellison Principal David Dominguez pointed out that the eight students on the gym floor surrounded by family and friends reached the day of signing through years of work with the strong support of parents and coaches and all excelled in the classroom. Semira Fields is going to Grambling State University to play volleyball. The Ellison coaches all praised their students for working hard in the classroom, going beyond the level of academic eligibility to excel in order to attract college recruiters. 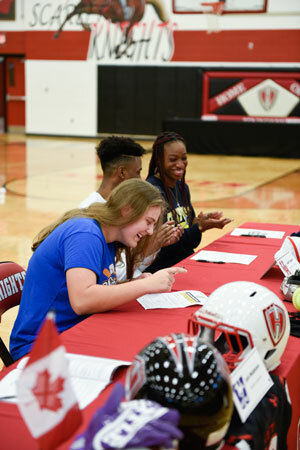 At the Harker Heights High School gym, Athletics Coordinator Jerry Edwards praised four students who signed to continue on to the college level. Heights tight end Jack Middleton is on his way back home to Canada, where he will play for Western University in London, Ontario. For softball player Jenny Saylor, the dream of playing college softball started years ago in t-ball. “I feel like my work ethic and playing travel ball really helped me get to where I am today,” said the future Jarvis Christian College athlete. For siblings Mckayla and Jalen Flowers, the thought of not going to the same school any more is hard, but they each know that they have each other’s back no matter where they go. Jalen Flowers is headed to the University of Houston where he will compete in track. “I am really proud that will have all made it this far,” he stated.